Well, not really of course. But Inhofe never stops trying, once again showing us his not-so-subtle mix of flawed logic and authoritarian politics. I’d like to believe that most people concerned enough about climate change to learn something about it can easily get beyond the double-reverse-alarmism-called-science methods Inhofe typically employs (as I like to call it – “scaring” us about the evil plot of climate change from rogue scientists and power-hungry liberals). 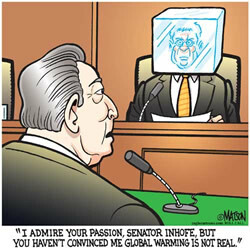 I don’t think there’ll be any satisfying Inhofe until he suddenly becomes Senator of a coastal state or Al Gore is forced to give back his Nobel Peace Prize in shame – whichever comes first. But even if most people can see beyond this noise, “senate reports” may sometimes be lent more credibility than they deserve, adding only a distraction to the public debate instead of a real argument. Credibility is important, wouldn’t you say? But perhaps, in the last flailing of a crippled and dying dogma, credibility becomes less important. This seems to be the case with Inhofe, as his latest list of “prominent” scientists (400 of ‘em!) shows here and here. This is not to say that there isn’t plenty to debate. 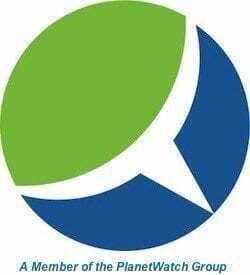 With the growing evidence of climate change all around us, we could move on to “so what are we going to do about it?” and have plenty to fight over – heartless, Machiavellian conservatives and lily-livered liberals in pitched battle over policy. What fun. It could at least be more productive than the continued and relentless grasping from a denialist/alarmist like Inhofe who displays, in my humble opinion, a fundamental lack of understanding in how science actually works. A good “elevator speech” on the scientific method, in the context of Inhofe’s latest barrage against the “climate change conspiracy”, is given today by Andrew Revkin in the New York Times. It’s time to get out of the way Senator Inhofe.